Book this half-day walking tour and see everyday life of local people in Tokyo. Unlike other sightseeing tour for tourists, your friendly professional guide will show you a different side of Tokyo while explaining the fascinating history and culture of Japan. Experience "depachika" where you can find broad variety shops for to-go food located at the basement of the department stores and visit Sunamachi Ginza "Shotengai" as a unique shopping street with small local shops alongside. Also stroll around the Japanese-style Kiyosumi Teien Garden and Fukagawa Fudouson Shrine to enjoy some serenity in the hustle and bustle of Tokyo. If you are tired of sightseeing like a tourist, this is a great opportunity for you to experience the most authentic daily lives of people in Tokyo. 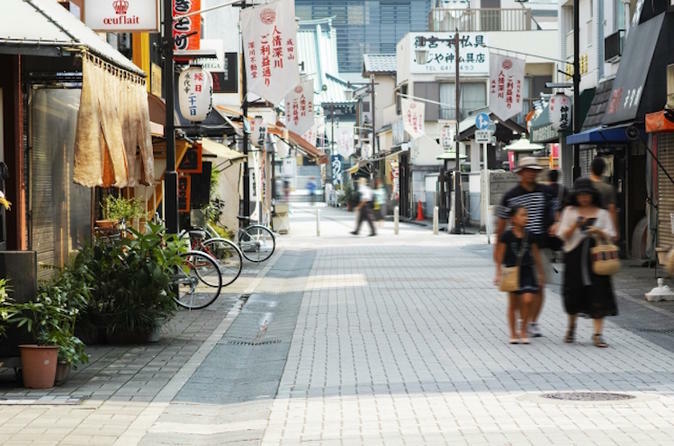 Meet your friendly local guide at Kiyosumi-Shirakawa Station in Tokyo in the morning and start this relaxing walking tour of local town to see everyday lifestyle of local Japanese. This tour will take you to experience "depachika", a combined word from "depahto", meaning department store, and "chika", meaning basement in Japanese. As "depachika" has various food shops, it is well known as a treasure trove of foods. It is also a good place to find exclusive Japanese bento box or other great variety of takeout food. Also visit the Japanese-style Kiyosumi Teien Garden nearby. The origin of this garden was the site of the residence of the famous Edo Period business magnate, Kinokuniya Bunzaemon. When the great earthquake hit the Kanto area, this garden was greatly damaged, but it saved a lot of lives by providing shelter to the local people. See the beautiful miniature lake "Sensui" located in the central of the garden with three small islands. The water of the lake is currently financed by rainwater, but in the past water from Sumida River was used. For this reason the pond by the ebb and flow of the tide landscape is said to have changed subtly. Don's miss Fukagawa Fudouson Shrine with 300 years history originated from the Naritasan Shrine located in Chiba Prefecture. What's unique about this shrine is the wall of the main hall. See Shingon (Mantra) of Acala written on the wall in a surprisingly modern style. People believe that this place is protected by the Shingon (Mantra) of Acala and prayer is held everyday at the main hall. The last stop is to visit the Sunamachi Ginza "Shotengai". "Shotengai" is the Japanese word for shopping streets with small local shops on both sides. Sunamachi Ginza arcade used to be a quite, small arcade before the air raid in Tokyo, but after the huge air raid in 1945, it became a scorched earth. Now it is one of the most popular shopping street with approx. 180 small shops that sell fresh local produce, everyday grocery, and everything else. Since this arcade was rebuilt after World War II, the local people has put a lot of effort to rebuilt the street and its unique atmosphere and culture has a vestiges of Showa period (1926-1989). Sunamachi Ginza "Shotengai" is now part of the daily life for the locals and there are about 18,000 people shopping or simply strolling there everyday. If you visit it on the 10th of the month, you can also experience the great bargain called "bakane-ichi", meaning the lowest price sale in Japanese. The tour concludes at Sunamachi Ginza arcade for your onward journey.